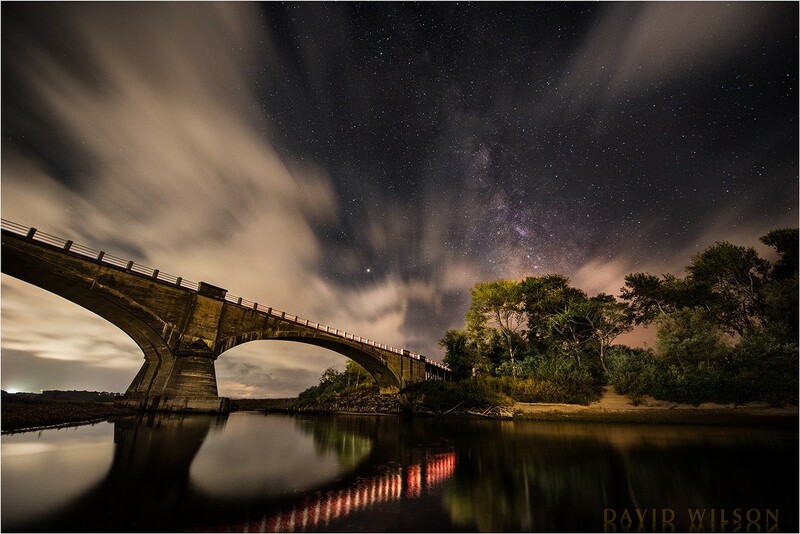 Historic Fernbridge sits out in the cosmos beneath a layer of sweeping clouds and the majestic Milky Way. Mars is bright at center. The lights from passing cars illuminated the shore and provided the reflections. Sept. 11, 2018. A photograph is not merely an impression of light, it is a combination of light and time. We don’t usually think about that as we snap our shutters in fractions of a second. Not much that we can notice changes in a fraction of a second. But when that element of time is extended a lot of things can happen, and nothing will look as it would in a daytime image, nor will the final image look as it did to our eyes at the time. 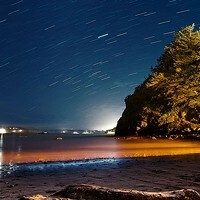 Playing with that element of time is one of the most exciting aspects of night photography. Fernbridge beneath the Milky Way is an image I have long desired. A beautiful span crossing the Eel River between the community of Fernbridge and town of Ferndale, it is probably Humboldt County’s most historic bridge, and has been in operation since 1911. 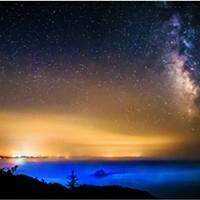 For over a year I’ve ached to photograph it beneath a dramatic starry night sky and the Milky Way. But things sometimes stand in the way. Much of the year there is no Milky Way over it, and that time is now fast approaching. The moon is in the sky about half the time, too, drowning out the stars. I think it must be overcast at night there more than half the time and the rest of the time it’s hard to find someone to go with me. Then, too, beneath that bridge is not a place where I want to be by myself late at night. This time I reached out to the Photoshop class that I teach in the Digital Media department at College of the Redwoods (I highly recommend the program) for anyone interested in learning something outside of class and two students who wanted to learn my technique came out with me to find out how I approach my night photography. I photographed this image on Sept. 11, 2018. It was interesting watching the cars and trucks crossing to the left or right. The lights of each left their own signatures on the landscape and on the water. Some had bright headlights, some dim; truck lights shone from higher angles, cars from lower. Red taillights mixed with cool or warm headlights. Every car painted a little light into the scene, each passing vehicle painting a new and unique stroke into the picture. There was a little ambient light coming from the structures across the Eel River behind us. Not all of the swathes of light thrown by the cars were captured on a single frame in the case of this image. I took several photographs — each identical — but each painted a little differently by the vehicles crossing at the time. Later I blended the photos selectively, choosing light strokes from each image to paint in the complete landscape and bridge. The clouds were passing rapidly overhead from behind me to in front of me, becoming dramatic streaks in the long exposure, an example of time and light working together. By good fortune their elongated forms converged at the same place where the rest of the lines in the image converge. I am not finished with Fernbridge at night. I may catch it again this season, but next year I plan to photograph it earlier in the year when the Milky Way would be in position for me to capture it as an arch across the entire bridge. I was ready to attempt that photograph some weeks ago, having rounded up willing family to come with me, but it was overcast when we arrived. I would be patient. Photography is a process for me. It’s not something I think about consciously, however. I hadn’t thought much about it at all until a friend and fellow photographer mentioned that he saw a process in how I worked. Of course, we all have our processes. So, what is mine? I might be a peculiar kind of photographer. There are levels of processes, some little ones like setting up and checking your exposure, or in editing the color balance and tonal range later. But there is a larger process of creating the image, which often begins with a desire. Photographers are hunters of light and moments, predators who either chase down or lie in wait for their prey. Some are nocturnal, others diurnal. Some catch a meal every week, while others nibble all day. I am a nocturnal hunter of light. 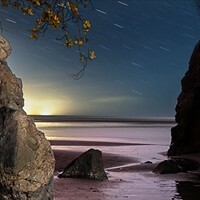 In making a nighttime image, I will often begin planning long before I shoot. I study the subject, both the angles as it sits in its surroundings and how it lies by the compass so I can envision the night sky over it at various times of the year. When will the Milky Way rise perfectly over this spot? Will the moon be out, and in what phase? Is it low tide or high? As the time approaches, I will also have to consider the weather forecast. When I do go out, I have a good idea what the scene will look like — a great unknown always being the weather along the coast or river valleys. Even with all the planning, I’m small and the universe is large, and unplanned things will happen. The unexpected is not necessarily bad, though, and amazingly a surprise often makes the photograph better, while the image I’d planned is less satisfying. I’m thankful for those times, and they help me to be a more patient light hunter as I suffer through the outings thwarted by fog, overcast skies, or otherwise. The unforeseen has so often made the images great that those times more than make up for the other times. It’s all part of the process.